Learning Community members shared their practices and insights at regular meetings. To share progress with and support the development of CCSS-aligned museum programs and materials that focus on American art. Information in this summary is drawn from the evaluators’ 2014 final report. In November 2012, museum educators participating in the learning community were surveyed by the Terra Foundation. The majority of respondents self-reported that they were only somewhat familiar with the CCSS-ELA and that their institutions had just begun to address how to modify existing programs and resources. Many museum educators shared noteworthy concerns about the CCSS regarding the use of fiction and non-fiction texts, the value of creativity, the time required to align resources to the CCSS, using the right language to communicate about the CCSS with others, and concerns about changes to existing programs and resources. Museum educators wanted the opportunity to learn more about the CCSS, especially in light of supporting Chicago teachers, addressing application of standards grade by grade, understanding how to deliver standards, and understanding the definition of “text” within the standards. Learning community educators were often using American art or visual culture in their programming at the start of the project, and many had ideas for new programs and resources using American art. Throughout the project, evaluators gained real-time feedback and input on the program via exit slips (short written surveys conducted at the end of each session) and observations of learning community sessions. In the summer of 2014, they assessed AACL participant perspectives via longer surveys and one-on-one interviews to determine how the learning community objectives were met, the main takeaways from participation in the learning community, and suggestions for future learning communities. How were the learning community objectives met? As described in the final evaluation report, learning community participants who responded to the survey felt the original objectives of the program were met, with greatest emphasis on understanding the nature of the CCSS-ELA, in writing, speaking and listening. Overall, 94% of participating educators responded that the program had a positive impact on their knowledge and understanding of the CCSS-ELA. The same percentage of educators reported that AACL had a positive impact on their confidence integrating these educational standards in their programming, and in articulating connections between their institution’s K–12 programming and the standards. All participants also felt that the goal of collaboration was met, in that strong ties were created between the participants across museums. This resulted in a number of post-learning community activities, including co-creation of learning units for museums and for school personnel; and the rewriting and revising of existing materials to align with the Common Core. All benefited from AACL programming from a professional development and institutional perspective. Data indicates, regardless of the duration of participation or frequency of attendance – all benefited from the AACL program. It is likely too early to assess learning community impact on each institution’s K-12 programming for teachers and students. Participants’ number one cited ‘takeaway’ during the final program evaluation was the opportunity to meet with other museum educators. They also cited the positive impact of the collaborations took place between museums, some of which continued after the learning community meetings ended. Participants all stressed the benefits of visiting other museums and seeing how each structured and implemented museum education. They also all stressed the benefits of learning from each other through this process. Other takeaways included: benefits of understanding and learning how to incorporate CCSS into lessons about American art, and increased use of American art in their current curriculum offerings. Individual participants reported that institutionally, the AACL led to creation of new curriculum, programming alignment to new standards, and collaboration with other institutions as a result of participation in the learning community. 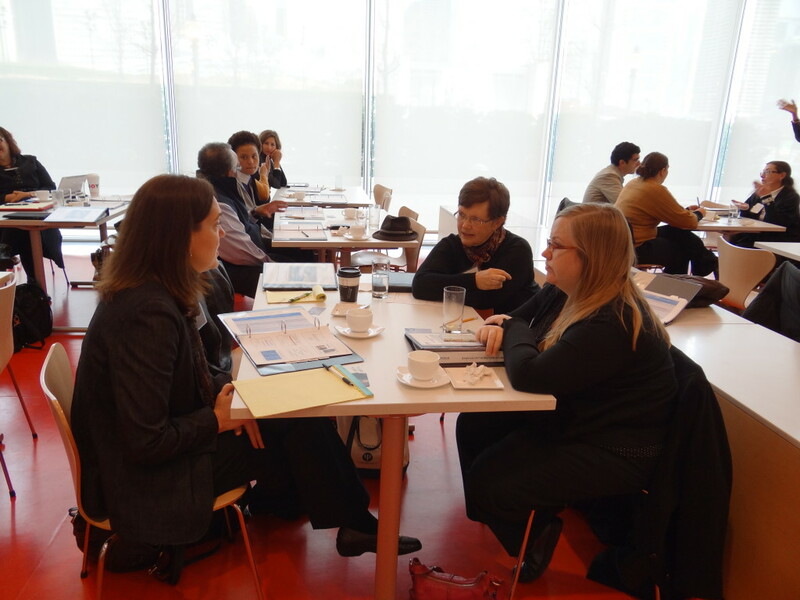 Evaluators found that participants valued the opportunity to work with other museum educators, and that this process was helpful to all of them in processing, learning, and implementing the Common Core State Standards into the teaching and use of American Art in programming. Many respondents requested that the learning community continue as new standards were released from the state department of education, and that the learning community continue to provide opportunities for collaborative learning with each other in museum contexts. Additionally, several participants suggested that future Terra programming be considered about the creation and implementation of student-focused programming (such as museum educators implementing programs on-site in schools), which is difficult for smaller museums given current funding allocations. Evaluators also recommend, based on participant feedback, that future learning communities give special attention to the size of the project, especially smaller projects that are distinct, but connect over a period of time; broader dissemination of results to reach more K–12 teachers/students; and opportunities for future projects that bring teachers and museum educators together at the same time to create and/or work on a shared vision.